By car: participants getting to Boisbuchet by car can check in from 18:00 on Sunday. 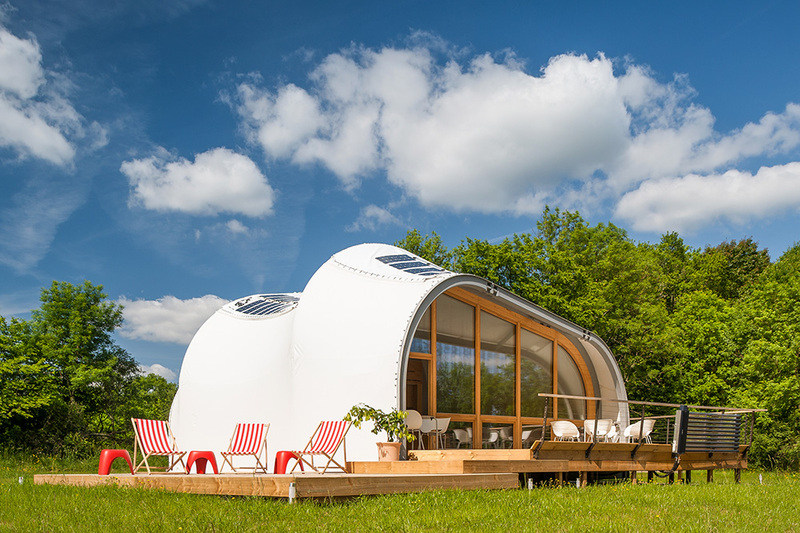 Early check-in is available (additional fees may apply), please contact manager@boisbuchet.org for more information. By train/airplane: participants who wish to make use of a shuttle service from Poitiers to Boisbuchet are requested to meet in front of Poitiers train station on Sunday at 17:00 (except for the Bauhaus on Fire workshop, when the shuttle picks you up on a Wednesday). You will be welcomed there by one of our staff members holding a sign “Summer Workshops at Boisbuchet” in front of the main exit of the train station. It will then take around one hour with our bus to get to the Domaine. Please make sure to be on time! There is no public transportation to Boisbuchet and a taxi costs minimum 100,– € (one way) and ride share services are sporadic and unreliable in this region of France. Once you arrive in Boisbuchet there will be a welcome reception at around 19:00. Afterwards you’ll be shown your room and at 20:00 dinner will be served. The first evening offers an ideal opportunity to make initial contacts with tutors, other participants, and staff members. The workshops start on Monday morning after a guided tour of the Domaine. After the tutor’s introductions to their topics, works begin. The schedule of the week is defined by the tutors together with their participants but on Friday afternoon a final presentation of all projects is held. 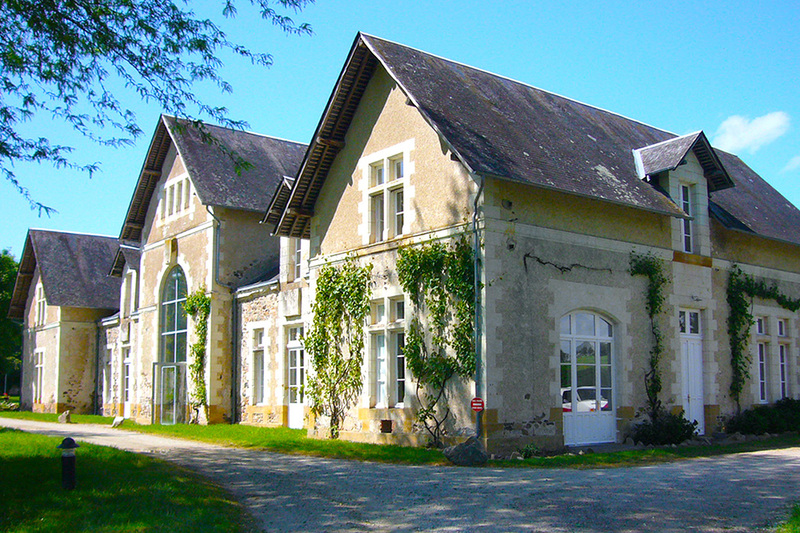 During your recreation, Domaine de Boisbuchet’s extensive, park-like grounds are perfect for jogging and hiking. In the evenings an accompanying program takes place – with lectures of your tutors, discussions and joint leisure activities such as Boisbuchet’s legendary Wednesday parties. All courses end on Saturday after breakfast. The bus leaves Boisbuchet for the Poitiers train station at 10:00. We advise you not to make reservations for trains leaving Poitiers before 13:30. Participants are accommodated in the Dépendance, the former service building of the Domaine, which now is our guesthouse. 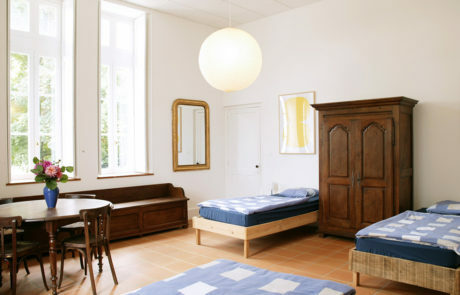 There you will find several rooms with three to six beds as well as a larger dormitory. All rooms have their own washrooms (WC/shower) and are furnished with comfortable period furniture. Your participation fee includes accommodation in shared rooms. Valuable items can always be locked in our office. Private rooms are available upon request for an additional fee and availability must be confirmed with manager@boisbuchet.org prior to booking. Please note that the amount of private rooms is very limited and provided on a first come first served basis. In any case, we will try our best to meet your preferences—please enquire via email or phone and we will make a note of your request. The day begins at 08:30 with a buffet breakfast of fresh baguettes, cheese, muesli, juices, coffee and tea. Lunch is at 1pm and comprises a selection of cold dishes with patés, quiches and salads in warm weather or vegetable soup, hot-pots, etc. if the weather is cooler. Tea and coffee as well as some biscuits are served around 16:00. 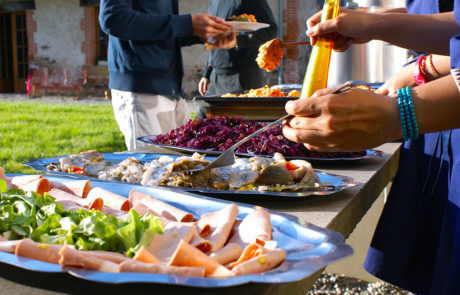 The evening meals consist of salads, a main course and a dessert, accompanied by wine and water. As a matter of course, Boisbuchet’s meals not only satisfy your culinary needs but also provide a basis for communication. In warm weather we eat outside, in front of the Dependance. With bad weather we eat in our restaurant – the barn’s side wing. Our cuisine is international and the kitchen is run by an experienced chef. We are happy to cater for vegetarians – just notify us in advance about your diet requirements. 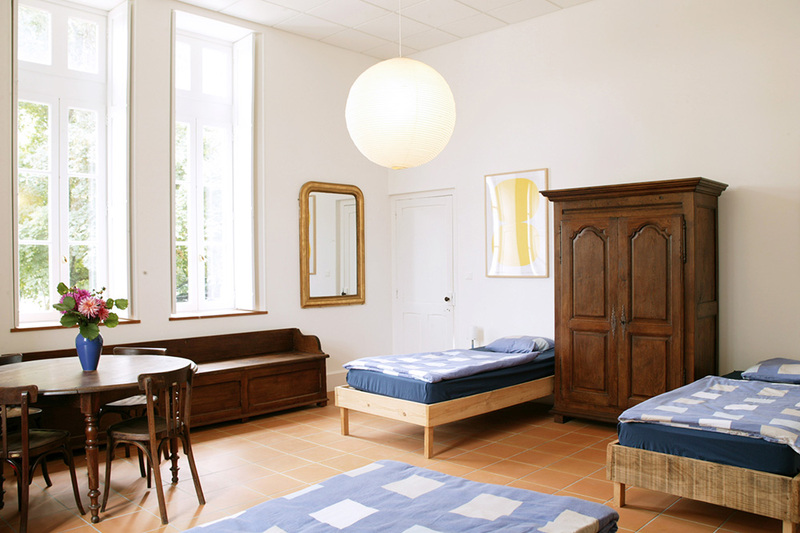 Bed linen are provided by Boisbuchet, but not towels (neither bath nor beach towels). You will need working clothes, solid shoes, a warm pullover, and a raincoat. The climate in Boisbuchet is similar to the Atlantic area and may be quite cold at night even in the middle of the summer. Do not forget a personal first-aid kit, which should include Aspirin, as well as medication for insect bites and for gastrointestinal infections. Please be aware that the nearest pharmacy is 9 km away and can only be reached by car. If you are allergic to pollen please bring your allergy medication. Do not forget to bring some Euros in cash (for your extra drinks at our vending machines or items you wish to buy at our shop etc.). We do not accept any other currency and only process credit cards in Euros. At Boisbuchet we have our own little shop where catalogues, miniatures, t-shirts, postcards and some other souvenirs can be bought. Each participant is responsible for arranging sufficient insurance coverage for the duration of the workshop: accident, liability and health insurance for travel abroad including return transport to your country (evacuation) as well as theft insurance for one’s personal effects. If you are on special medication, make sure to bring enough with you. Confolens, the nearest town, is 9 km away. It has pharmacies and a hospital, but if special medicines need to be ordered, it may take a few days. If you have any food or general allergies please inform us in advance. Boisbuchet is located in the Southwest of France, near the town of Confolens, between the cities of Limoges, Angoulême, and Poitiers. If you travel from a distant country, the easiest is to fly into Paris (however, please note that there are also direct flights from London to Poitiers). In Paris you can take the TGV train to Poitiers (approx. 90 minutes). Most trains to Poitiers leave Paris from Gare Montparnasse, but there are also direct trains to Poitiers from Charles de Gaulle – Paris’ main international airport. Please make sure to book tickets for the TGV in advance, as you are not allowed to board trains without a valid reservation. Check for trains on www.voyages-sncf.com and for local traffic in Paris on www.ratp.fr. We strongly recommend to take the train to Poitiers – it is the most convenient way to get here! Most trains will pass through Paris but there are also direct trains from Strasbourg. Participants who arrive from Portugal or Spain usually travel via Bordeaux and Angouleme to Poitiers. For further information, please contact us or your travel agent or visit the French railway website www.sncf.com. To car drivers we recommend the following tools, helping to plan your trip: www.viamichelin.com or www.maps.google.com. To get to Boisbuchet you should insert the following directions: Country – France; City – 16500 Lessac; Address – Domaine de Boisbuchet. Arriving from Poitiers, you should drive through Pressac and right afterwards take a turn left towards Lessac; in Lessac you must take the street on the left side of the church and at the end of that small street go left – after hundred meters you’ll see a blue sign indicating Boisbuchet. Arriving from Confolens or Bellac, please follow the road signs to Lessac and find the church. We strongly recommend to print out a map of Lessac and the surroundings. The participation fee includes full board, lodging in a standard (shared) room, the tuition fee, and all materials for your workshop. Please be aware that onsite we only accept Euros in cash or payments by credit card.